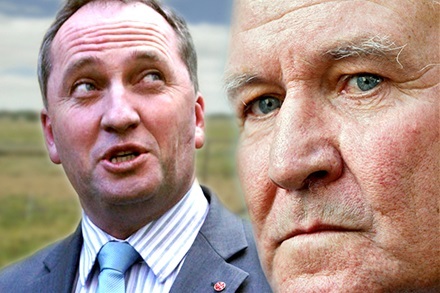 TENSIONS between Independent MP Tony Windsor and Queensland Nationals Senator Barnaby Joyce flared up in a robust exchange in the parliamentary press gallery in Canberra on Wednesday. As politicians walked the press gallery discussing the previous night’s budget, Mr Windsor and Senator Joyce unexpectedly crossed paths, sparking a brief but fiery exchange. Senator Joyce had earlier used parliamentary privilege to try and link the $4.625 million sale of Mr Windsor’s family farming property to Werris Creek Coal, a subsidiary of Whitehaven Coal, and corruption allegations against former NSW Labor Resources Minister Ian Macdonald. Relations between the pair are already strained with Senator Joyce challenging for Mr Windsor’s New England seat at the upcoming federal election, in a bid to enter the Lower House. Senator Joyce said he was “accosted” by an angry Mr Windsor who told him to “say it outside”. Mr Windsor was referring to the comments Senator Joyce made in a three-minute speech in Senate debate on Tuesday on Mr Windsor’s Environment Protection and Biodiversity Conservation Amendment (EPBCA) Bill, which is linked to water protection measures for coal and coal seam gas (CSG) mining projects. Senator Joyce said the Bill – which has already passed the Lower House – would be supported by the Coalition and Mr Windsor was one of its “grand architects”. “Minister Macdonald was the minister in NSW when Mr Windsor sold his place for a very good price; for a very good price,” Senator Joyce said in the Senate debate. Mr Macdonald is currently the subject of a high profile corruption investigation in NSW over allegedly corrupt mining deals. “But it is a question we rightly want to ask: how do you manage to sell your place for such a good price? “How do you manage to get three times what it is worth? Speaking to Fairfax Agricultural Media, Senator Joyce said his political foe was “highly sensitive about the sale of his land to a coal mining company which he made an extremely good price for, a bit less than $5000 an acre”. “He’s so sensitive about it that he wants to accost me as I walk through the corridors of parliament house and he did it in front of people,” he said. “Everyone can attest to it, I walked past Mr Windsor and in an agitated state, he asked if I would take something outside. “At the start I thought he wanted to fight me, which I thought was a bit beyond his age. The real question is how long has Mr Windsor owned the land? If only for a short period then the writing is on the wall. If for a long time then it is probably opportunity knocking. As long as valuable farming land is not left a wasteland or the water table polluted and altered then most people might be ok with mining. What ignorant and conflicted governments fail to address is that mining is short term whilst food is what keeps us alive over generations. Have they not heard that business in Australia has determined that we are to have a population of 40 million growing to around 100 million people. Methinks Windsor doth protest too much! “…..All bureaucracies become criminal mobs if given enough time and power. This is a screaming red flag with a clear message: Government is TOO BIG, too complex, too powerful and is operating far outside its limits of power.